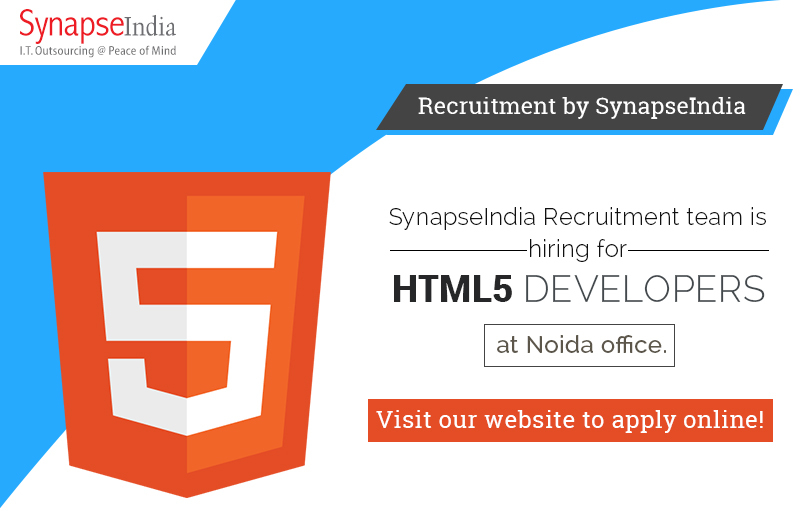 SynapseIndia recruitment team is hiring for HTML5 programmers to join our team at Noida locations. Headquartered in Noida, SynapseIndia is highly respected IT outsourcing company in Noida dedicated to helping global businesses with world-class IT solutions. Our strong team of skilled professionals specializes in rendering innovative and out-of-box apps using prevalent HTML5 technology. We have been working on HTML5 from a long time and our professionals bring in-depth expertise and proficiency in application development for web & mobile platforms using HTML5. Checkout current openings for HTML5 developers. Interested candidates can send their updated CV to SynapseIndia recruitment team.